Driving out the Hole-In-The-Rock road, only piñon-juniper forest, sagebrush, sand and the bulk of Fifty Mile Mountain greet the eye. No clue is given to the marvels carved into the stone but a scant mile away. And marvelous they are: the Canyons of the Escalante provide oases of lush greenery between soaring sandstone walls. The vast area is dotted with abundant arches, lush streams and lovely vistas. It is quite a place, not the least for its vastness and variety. Plenty of variety of adventures are possible, thanks to steady supplies of beautiful water in many canyons. The number of published technical thrash-fests are few; the number of divine, incredible explorations high. The level of adventure is high - please help keep it this way. Endowed with beauty rather than grandeur, the Escalante is an area of long and marvelous canyons that make perfect multi-day wilderness journeys. The Escalante is spread out. It often takes an hour or more to drive to your trailhead from the main road. Be sure to plan your travel, and have enough water, food and fuel to avoid emergencies. No water is available outside of town and a few key spots. This is a big, wild place: treat it with respect. For technical canyoneers, please respect the wilderness nature of the Escalante canyons. Almost all of the canyons in the Escalante have been descended without the use of drilled anchors - respect the local standard, and come prepared to descend difficult canyons without drilling. Advanced natural anchor skills will also allow you to descend with little trace of your passage. The Escalante is dominated by fairly tame but long and marvelous canyons that beg for multi-day explorations. Many daytrips are available - both easy strolls and strenuous thrashes. In either case, once you are there, you are probably in for a fair amount of driving and plenty of hiking. Keep a good supply of water in the car. Careful planning pays off in the Escalante; the area is too expansive to just show up and do stuff. Do your homework. One resource is the USGS Escalante Stream Flow data site, which can be a good indicator of river and stream flows in the area. The few hikes listed here only scratch the surface. 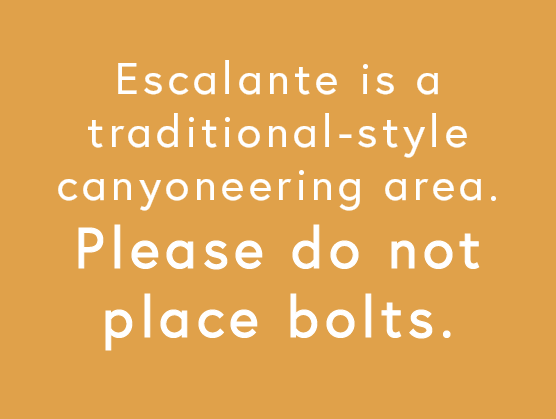 Personally, I head to the Escalante whenever I have more than a weekend to put together. Summers are very hot, but hikes can be found by carefully selecting canyons with lots of water to keep cool in. The usual seasons are Spring and Fall, though many great hikes can be done in winter also. Steve Allen's rather stupendous guidebook Canyoneering 3 does a very good job of covering most of the Escalante area. Doesn't leave me much of a soapbox, but I'll post a few of my favorites, and toss in a few variations to Steve's wonderful work. ...and take any archived canyon profiles with a grain of salt. Many of my descriptions in this area are in Archive form (read: an old-school PDF). These archives represent many of the first canyons I attempted to elucidate for the benefit of fellow desert lovers, and the descriptions are...what they are. Juvenalia. A bit rough, compared to the current level of polish. Many people still find them useful, however, so let's keep them available, with the understanding they have not been maintained and thus should be read with a grain of salt. If you're looking for a guide service to take you into the far reaches of the Escalante wilderness, we have a few suggestions, namely Excursions of Escalante & Escalante Outfitters. A bit more on them below. 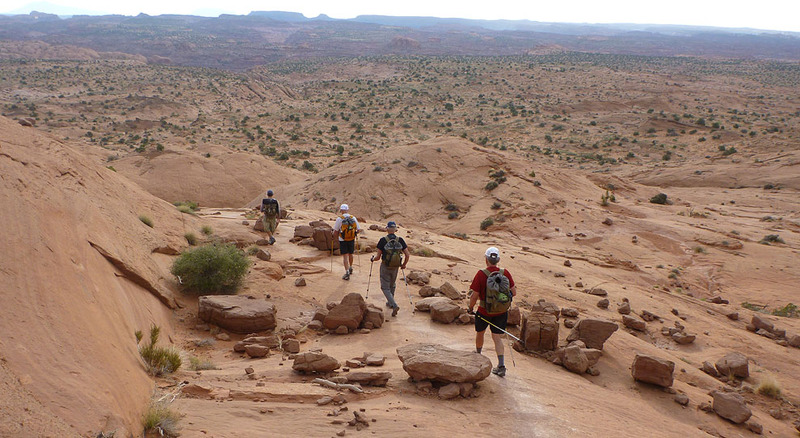 Excursions of Escalante is the area's locally based professional guide service. Their commitment is to safely guide guests beyond the more accessible places (Spooky, Peekaboo, etc.) and into the most remote, most beautiful and most pristine corners of the Escalante region. Their guiding permits in the Grand Staircase-Escalante National Monument, Box Death Hollow Wilderness Area, and Dixie National Forest allow them to offer unparalleled off-trail hiking, canyoneering and backpacking opportunities. Hiker shuttles by arrangement, call for details. Escalante Outfitters is THE AREA'S LARGEST OUTDOOR STORE serving all of your hiking, backpacking, camping, canyoneering (including Imlay Canyon Gear), and touring needs. They have a full line of maps, topos, guidebooks, gear and supplies, and are the area's only state liquor store (featuring a great wine selection). They also have high-quality souveniers produced by local artisans, and free wireless internet access! Pizza and beer on the porch is an after-canyon tradition, and for those for whom sleeping in the dirt is not preferred, there are nice cabins out back, too.